RoboSavvy is collaborating with GrabCAD for this challenge. Together, we are gathering fresh ideas for the design of a new Humanoid Robot for entertainment and educational purposes. 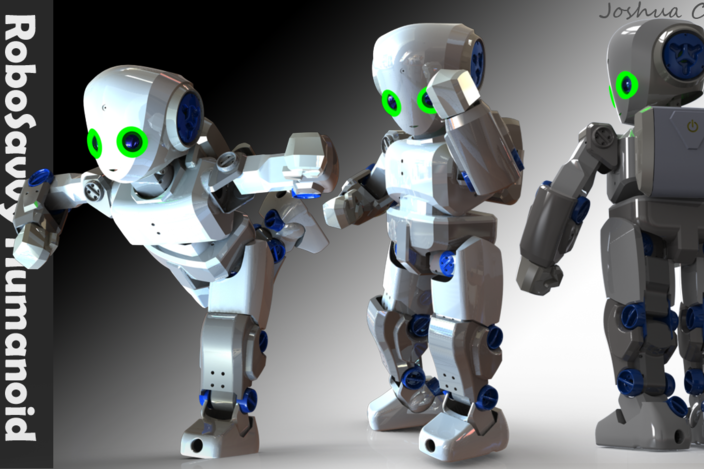 Our objective is to launch a new open-source Humanoid Robot that will be agile and smart at an affordable cost. Similar Humanoid Robots used for Education and Research can cost over $10,000 due to the cost their plastic molding exterior shell, costly actuators and closed-source business approach. We're looking forward to an open-source robot design that will outperform its rivals while maintaining the price of materials to only about $1,000. To achieve this, materials and fabrication methods which are available to anyone will be used. Materials include 3D Printed parts for structure, vacuum formed polycarbonate for the shell, servos for actuation and low cost electronics such as the Rasperry-Pi for brains. The 1st place winner will be awarded their own custom-designed robot and a cash prize of $800. If you are interested or would like to submit an entry, please visit the Challenge Page. So far, a few entries have been submitted. We are really excited to see everything participants come up with! Looks great! Thank you for sponsoring this contest; I can't wait to see what comes out of it! Good luck to you, and to all the participants! Thank you, Joe! We're also eager to see the submissions. Thank you very much for spreading the word and posting it on your blog. We already have eight great entries for the Humanoid Robot Design Challenge! The Grabcad Humanoid Design challenge finalists have been posted, the winner will be announced on Monday. Which is design is your favorite? We would love to hear your opinion! The Humanoid Design Challenge winner has been chosen! GrabCAD, the platform for open engineering and home of the world’s largest community of mechanical engineers, collaborated with RoboSavvy on a Challenge to gather fresh ideas for the design of a new humanoid robot designated for entertainment and education. The objective of this competition was to crowdsource a winning design of a new humanoid robot for entertainment and education. The robot had to be open-source, agile, smart and affordable to schools, universities and hobbyist through DIY fabrication. We are passionate about making this technology affordable to all. Comparable education and research humanoid robots cost over $10,000 due to their plastic molded shell parts, expensive actuators and closed-source business approach. RoboSavvy wants this to be an open-source robot that will outperform its rival platforms while keeping the cost of materials to about $1,000. This will be achieved by utilizing materials and fabrication methods available to anyone. Materials include aluminum sheet and 3D printed parts for structure, vacuum formed polycarb exterior shell, servos for actuation and low cost electronics including Raspberry Pi for brains. The 30 designs submitted were all excellent, exceeding expectations... It was extremely difficult for judges to decide. Congratulations and thank you to all who participated. 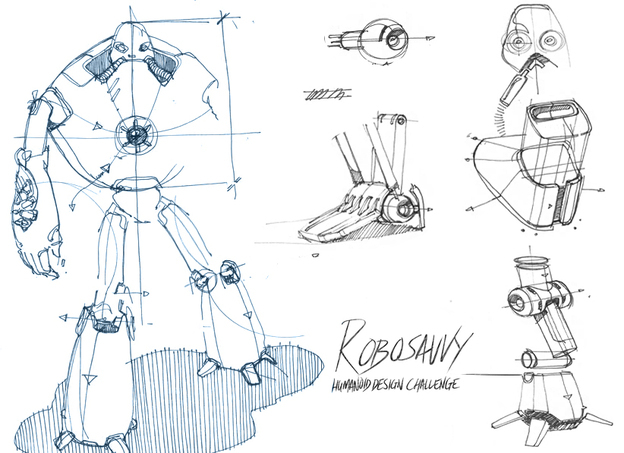 After much anticipation, here is our winner: RoboSavvy Humanoid Design - unl by Joshua Chung. See all of the RoboSavvy Humanoid Design Challenge results on the GrabCAD Challenge page. Over the next few months we will be working with the winning designer(s), with the help of Robotis who is sponsoring 24 servos, to begin developing the opensource design so that it can easily be manufactured and assembled by anyone. In addition, we will create opensource software that will allow anyone with basic technical skills to control the robot's complex movements and enable human-robot-interaction.